I've been meaning to watch this documentary for awhile now and throw it in with the last round of my grand Star Trek Cycle (tentatively set to conclude in October, for those keeping score at home) but instead, Amazon Prime released pretty much all the movies, so I made my way through those instead and decided to do this one on its own and I'm glad I did, because it deserves it's very own post. 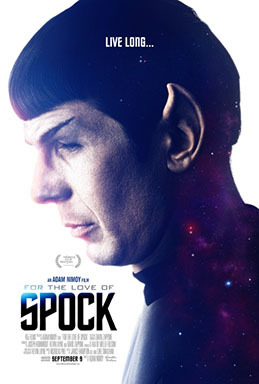 Directed by Adam Nimoy, son of the late great Leonard Nimoy, the documentary was originally conceived as a documentary about Spock, the character with an eye on release in time for the the 50th Anniversary of Star Trek in 2016. After the passing of his father in 2015, however, Nimoy widened the scope of the film to include not just Spock, but the life and career of his father beyond that character.